United Nations diplomats, federal agencies and the United States military depend on highly secure mobile communications equipment. Dataline, Inc., of Norfolk, VA, is a leading provider of Data Communication Devices (DCDs). Dataline's DCDs are scalable, mobile multi-network data and voice communications packages. "They securely and simultaneously extend garrison classified networks, unclassified networks, video, and telephone capabilities worldwide via multiple transmission paths", explained David Huisenga, Senior Systems Analyst for Dataline. "On-going advancements in these devices have allowed for information to pass back and forth easily." The increased use of DCDs has motivated Dataline to develop new models that meet today's commercial airline carry-on regulations. The DCD Brief Case (DCD-BC) is an easy-to-use, robust and lightweight mobile unit capable of scaling up to support a forward headquarters. 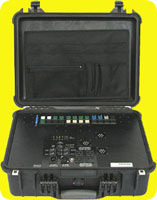 The DCD-BC and additional network devices are mounted in Pelican 1520 cases, backpacks and other cases for transport and operation. The DCDs require an Ethernet switch that is compact and reliable. When the previous switch proved inadequate, Dataline contacted Contemporary Controls in Downers Grove, Illinois. Contemporary Controls is a manufacturer of Industrial-grade Ethernet switches marketed under the CTRLink® trade name-all proven superior to office-grade Ethernet equipment at an affordable cost. In addition to the compact size, the EICP8M had to perform well in environments like Iraq, Afghanistan and Africa. "In these environments, the aim of the switch is to improve the exchange of information," says Huisenga. "The switch hasn't failed to respond. We are extremely satisfied." By definition, a VLAN allows the logical separation of network traffic-providing higher performance and higher network security. Ports on the switch may be assigned to individual VLANs, thereby restricting VLAN traffic. VLANs only allow communication between devices in the same VLAN. Huisenga commented that the VLAN capability allowed them more flexibility in meeting security requirements requested by some customers without incorporating another device to provide the security. Huisenga said his company has had requests for temperature gauges which require another physical device within the DCD. This Ethernet switch performs the temperature monitoring function allowing Dataline to decrease the number of components installed in the DCD. "Now we've reduced an entire subsystem within our deployable communications packages," he added. Both copper and fiber versions are available in the EICP8M Series for specific applications where 0° to +60°C temperatures are expected. Designed with conventional features usual in Plug-and-Play (PnP) switches, the EICP8M also includes such important benefits as RapidRing®, trunking, Quality of Service (QoS), SNMP (Simple Network Management Protocol) and a programmable fault relay that can be connected to supervisory systems. Individual port parameters and other feature settings are configurable. Huisenga said they would investigate the use of RapidRing and trunking-solutions for applications requiring maximum uptime for an Ethernet communications network. The EICP8M Series is shipped with a DIN-rail clip for installation with a TS-35 DIN-rail. If direct mounting to a sub-panel is needed, an optional panel mounting bracket, shipped with the product, can be installed after removing the DIN-rail clip. A choice of network management software (iSNMP™ and IntraVue™) is available as well.